Discussion in 'Plugin Issues' started by RockinChaos, Mar 3, 2019. -Better communication and transparency between Players/Staff and among Staff themselves. This involves replying to Suggestions, telling Players what is going on, Staff coordinating more, a weekly word from Staff, etc. -Better resets-- Staff should be given a lot of time to prepare for each one. More details here. -More time and thought put into each Plugin that is added, so that issues like Villager stacking don't arise. -Player Ranks and Donor Worlds are a priority right now- and they always need to be treated as such. -Despawning and mob stacking issues- these have long plagued CC, and cost Players and Staff lot of time and resources to deal with. I am certain that we will remember other crucial issues that need to be fixed, but this is it for now. I encourage you to read through this thread once you have the time, as it better captures everything I have summarized here! Az', RockinChaos and PackTehKartoshka like this. Items despawning under 5 minutes, which has caused many Players to lose valuable gear upon death, and entities despawning that shouldn't, like hopper minecarts. all of those have been turned off. check after next reload and see if they still are stacking. Hello everyone! This is Ryyy here. If you could please reply to this with your issues that will help me bring the exact problems you have to ergo. Please keep each issue as short as possible. For example if animals are despawning after a certain time or after a certain amount have been bred then just say something like "Animals despawning after X minutes/hours/with reload" or "Animals despawn after i breed them up to 30 total" I'm sorry that some of these issues have gone on for awhile and i'm hoping to help fix these as soon as possible. PLEASE RESTATE ALL ISSUES EVEN IF THEY ARE ALREADY IN THIS POST. THIS MAKES IT EASIER FOR ME BECAUSE I CAN COME TO ONE LOCATION AND SEE THEM AND DON'T HAVE TO READ THROUGH A BUNCH OF TEXT. Can you guys get rid of guardians stacking? It's very annoying. Az', Finn_The_Hobbit and RockinChaos like this. RockinChaos, Az' and Finn_The_Hobbit like this. This is a quote from one of Az's long walls of text on this thread. "Tweaking the Essentials plugin to disable losing /fly on disconnection so players don't die after reloads anymore." It seems kind of stupid to me that /fly gets disabled every time you log off and I don't see anything bad happening if it was set to stay on. As Az said, players can often lose their items due to sudden server restarts. This is more of a problem now, because as I am typing this, the server has just froze suddenly with no warning, and it's not the first time this has happened. That means that players who were in the air at the time could lose their items from an unnatural death. Sure, a mod can refund those items, but it could have been a whole inventory, or the player may not remember exactly what they have lost. If it was set to stay on, there would be less refunds needed and it would cause less stress for players. Another thing CorbaCraft needs to see is Ergo releasing an official statement on all of this, and keeping us posted with update(s) each week on the Forums. For being a Server Owner, we barely ever hear from him, and when we do its usually because of a large Server Update. I get that we all have a life outside of CorbaCraft, but I am certain that Ergo can find the time to compose a lengthy (Although explanatory) post for this, and the time each week for a personal update post. I have also thought of an important change that would fall under improved communication. I have noticed that Staff oftentimes don't read through an entire thread before replying, which can feel discourteous. I understand that in certain situations (Such as this one with you, Ryy) it is excusable, although I highly recommend that Staff read complete reading the thread through when they have the time. This goes for everyone, but for Staff it should be a requirement. Anyone, not just Staff, is unable of capturing the depth and deeper meanings of a conversation by just skimming what people have said. It is unfair to reply with the intent of furthering the conversation if you do not have a complete understanding yourself. We never skim Staff's posts, so we simply expect the same courtesy in return! RockinChaos and Az' like this. I feel as if something has slipped everyone's minds lately: Events. It has been 3 months, yet the only weekly Event we have is the Mob Party. I know that Event Arenas have been built, so why have the daily Events stopped? Events have always been an integral part of CorbaCraft, and everyone misses them. We have been told that we will "see them soon", but seeing how it has been 3 months I suspect that something else is afoot. Events are another thing that CorbaCraft needs to see, along withe everything else listed here! True, although this would be a change that should be sent to Ergo along with everything else. You are right though, so @Josh_ can you give us an update on Events please? What is going on with the Events? The event team have 2 events currently (Pooltable & Spleef). Yes! We can host them. BUT! Without the event server its a bit different . It is known we will be hosting 2 events per week (not included mobparty). The problem is, is when to find those times. Due to 1.13 and the New block Ids we cannot use the old events so therefore new ones are being made, along with that I have given builders projects but they have more projects with higher priorities!. I can either rush the events and they wont be up to standard or I can take it easy and they will be great! I want to give my deepest sorrows to the fact it is not out but I will have an announcement soon. Thank you for your response! I hope that we will be seeing more Events soon, and that you find suitable times to host Pooltable and Spleef. Although I am largely uninformed on the situation, it might be worth considering hosting two Events on Friday and Saturday. One Event would be timed for those in the U.S, and the other Event timed for those in the UK/Europe. Considering how CC has an Event Vet in both timezones, it could work, although I'm sure there are further issues to work out. LB_Firelord, RockinChaos, Az' and 1 other person like this. Not like this is going to matter since it seems like everything about "power abuse" keeps getting shoved under the rug as "it will be forwarded to an admin" however I would like to state a second instance of a staff member abusing their rank to abandon my friends claim with no warning. 1.) They had a claim set up in the shopping district so they could build a shop next to me--mind you I created the whole pathway in this specific area, and my friend claimed their spot and set up some blocks near the entrance and a mod that is building with a player basically had my friends claim removed so they could expand their claim into my friends claim. Not quite sure how that is fair but whatever. All their other claims are untouched however this specific one was removed--again with no warning or message, etc. Also, this is not a jab at "staff members" just the people who seem to have world edit perms and the ability to remove player claims that keep doing this.. 2.) 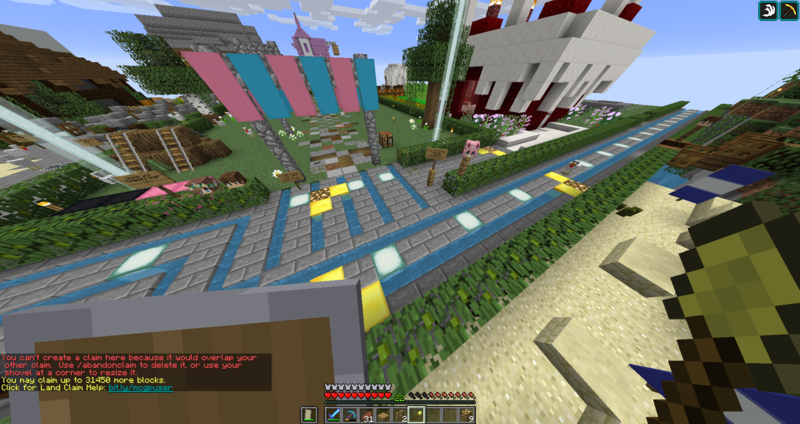 Let's also mention how I claimed my friend's shop front (this is a different area than the previous issue stated above) so it would stop being griefed and well.. look at that its almost like someone who has the ability to bypass claims griefed it anyways! :O magic. So why can't I do this since... someone is apparently allowed to do this? I take a break for a week from the server in hopes that the issues will get sorted out.. and I come back to the same issues as well as some new ones. Az' and Finn_The_Hobbit like this. I agree, the issues of Staff abusing their power needs more attention. Power abuse by Staff leads to serious, and often times hurtful, situations towards other Players and Staff. Just ask @Az' -- he experienced it first hand. It disheartens me even more to think that that Staff member is still Staff- despite their misbehavior. Keep in mind that the mass majority of Staff are good at their job. By no means am I saying that all Staff abuse their power! However, Staff must be held to a higher standard than Players are- just like anyone in a position of power. Because your actions have more consequences, your punishments must have more as well. I too, am taking a long break from CorbaCraft. I, like many others have been worn down by these consistent issues. While I may pop on for a few minutes now and then, I will abstain from any sort of building and the sort until everything is patched. I will be more active on the Forums, however. This is another major issue that needs to be added to the list and addressed soon. ShelLuser, RockinChaos, Az' and 1 other person like this. @Matthias1266 From what I can tell, what Finn is saying is just in addition to what RockinChaos said, as well as pinging Ryy (since he requested earlier in the thread we do so). Not quite reporting any new issues. RockinChaos and Finn_The_Hobbit like this. @Reg got it right, I was adding my thoughts on the matter and pinging Ryy, so that he could add it to the list of issues that need fixing. RockinChaos and Reg like this.